Even in the humblest of home setups, these steps ought to be carefully planned and budgeted for. All of these factors can be very overwhelming to properly assess. We're here to lend a hand in helping you put together exactly what you need to meet your goals in the studio. After the purchase of this package, we will setup a time to have a 1 hour phone consultation (longer if necessary). You will be sent a form to fill out in advance of the consultation that will help to ensure a highly productive phone call. After the consultation, you can be assured that you will have a solid foundation and road map for the project ahead. We guarantee your satisfaction or your money back -- no questions asked. For those of you in the Los Angeles area, we are more than happy to do this consultation in person at our studio facility in the Silver Lake area. For questions related to this consultation please phone us at 323-319-5936 -- however, please note that we must insist on this package being purchased through eBay before any consultation can be scheduled. Please read below to learn a little about our company and our approach to planning & designing the studio of your dreams. Proper integration of your setup is at best an after-thought in the typical client/gear-salesman relationship. People have grown complacent with buying their equipment in one place, finding the right cables on their own (or trusting a less-than-knowledgeable salesman), and hoping to integrate it all in a way that actually works -- let alone works to complement their unique style in the studio. Pro Audio LA is here to change that paradigm. We don't want to seduce you with typical sales rhetoric. Our lone objective is to integrate a workflow and a selection of appropriate equipment alongside it that gets you one step closer to achieving your goals in the studio. Making the right gear selections is only part of the battle. The right gear, when poorly integrated, at best will keep you frustrated and spending more money hoping to achieve what you'd first envisioned. When one's creativity is stalled due to poor equipment integration, it's very easy to blame the gear. THE MISSING INGREDIENT IS PROPER INTEGRATION AND WORKFLOW. 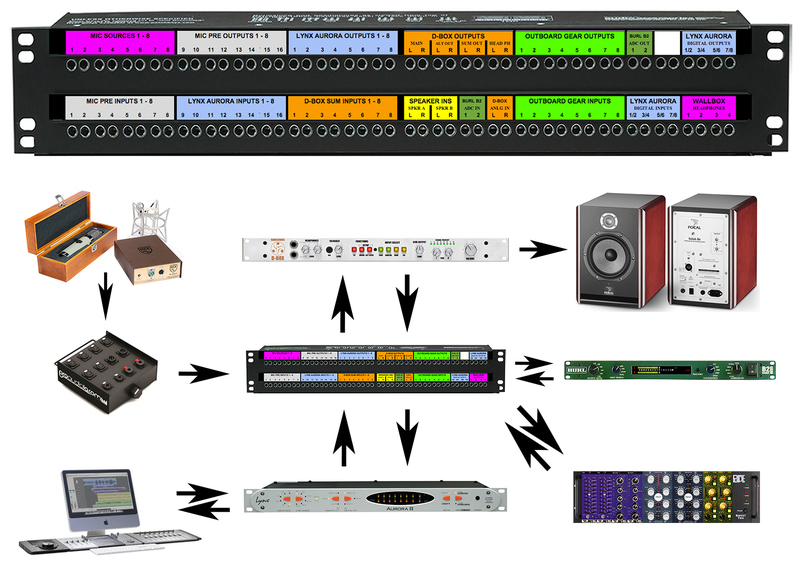 Have you thought about a patchbay but don't know where to begin? Have you bought a lot of expensive "toys" that aren't really netting you the results you'd hoped for? Well, most likely nobody has taken the time to properly understand your unique needs and designed a system that works FOR YOU. When you work in a properly-integrated setup, creativity can finally take over. You can forget about the details and follow your instincts. If you've grown frustrated, we understand. Every day we speak to clients who have been steered aimlessly in the wrong direction. Give us a chance to take you under our wing and show you why working with professional integrators who are also seasoned audio engineers is the only way this type of business should EVER be done. There's a reason our clients are loyal and won't go back to shopping at the "big box stores" again. Those stores simply aren't designed to assess your unique needs and be there to support you before, during, and AFTER a sale. Pro Audio LA is. Wouldn't it be nice to spend money on the right equipment and take it home confidently knowing you'll be able to easily plug it all in and get the most out of it? Wouldn't it be nice to know if you had a question there would be someone available to help you? Isn't that how this process should work? It's time to get to work on making music. After all, wasn't that the point of all of this to begin with? Don't "spin your wheels" anymore. Let's get your setup right so you can return your focus to the music. Our staff has extensive experience with studios of all sizes from bedroom setups to world-class facilities. We are experts at studio workflow designs catered to maximizing your specific individual needs. Purchase this initial consultation package for $60 and discuss your project with an expert integrator for 60 minutes. We'd be happy to help you devise the perfect studio concept to get the most out of your setup. A good consultation will save you a great deal of time and money. Should you need additional consulting services, they are available on a per hour basis @ $60 per hour. This is a premium built cable using only the best quality components. We put professional finishing touches on our cables you won't get most places.